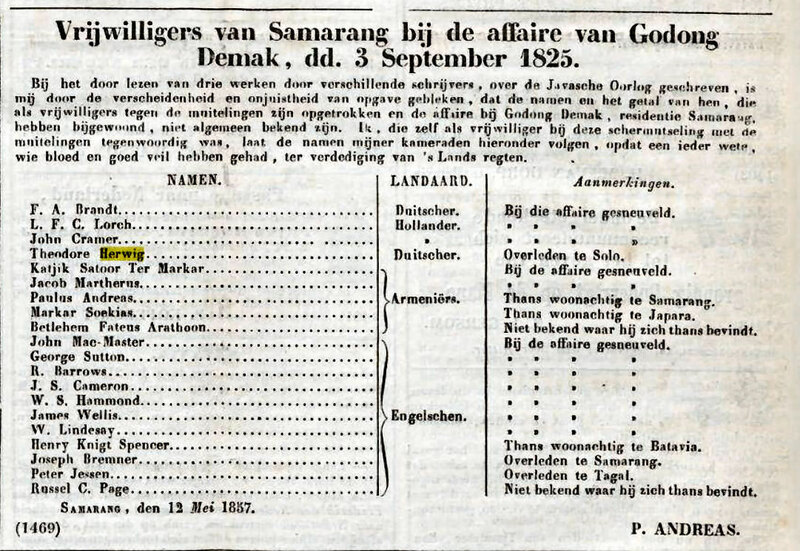 1815: The return of the Dutch to Java. 1822: The appeal for help from the Dutch to Agha Hovsep. 1825-1826: The second Russo-Iranian war. The war between the European Allies and France ended in 1815, Napoleon was banned and Holland became free again. However, Holland was almost in a state of bankcruptcy. Being a province of France for 5 years, the country lost lots of cash in order to contribute the French. 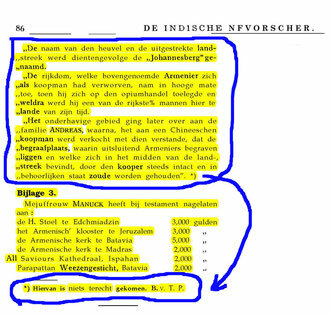 The Dutch Indies were occupied by the English, so there was a huge lack of cash and income from that part of the world too. Besides: Local kings and local residents of Indonesia awoke slowly from colonial repression and the colonial administration got into financial troubles. The taxsystem was imperfect; corruption was all around and accordingly the Administration was creating several possibilities to built up the state's cash flow and reserves and Agha Hovsep watched it all and noticed his chances. Agha Hovsep became one of the most richest men of this part of the world; he raised billions and billions. More and more the Java War was nearing and the Dutch Indies Army had to spend money to prepare itself and to built fortifications in Mid Java, as the specter of war came from the sultanate of Jogja. 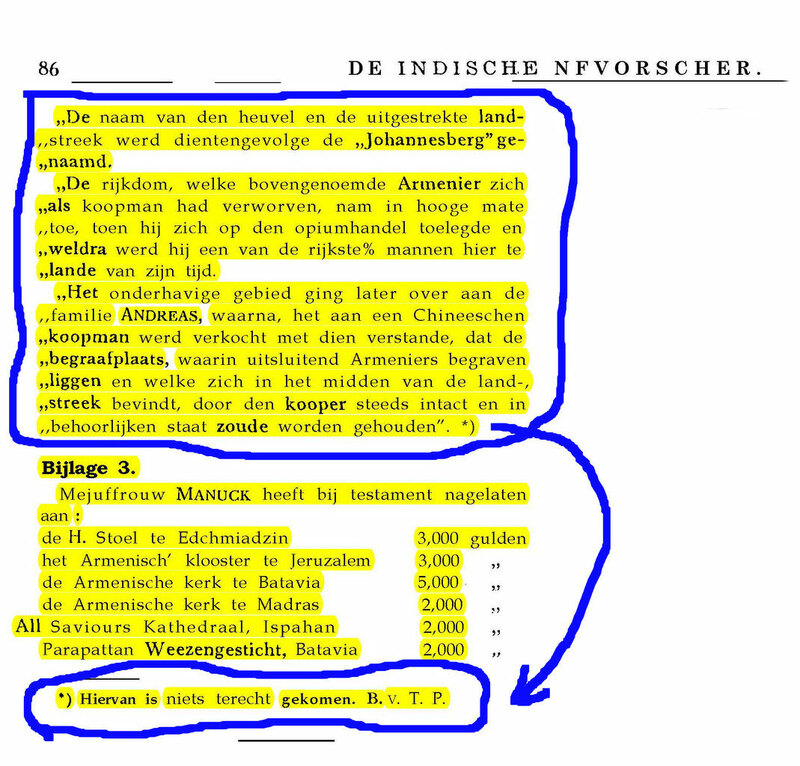 1) Martherus, Andreas and Soekias were related Armenian familymembers of the Johannes family. 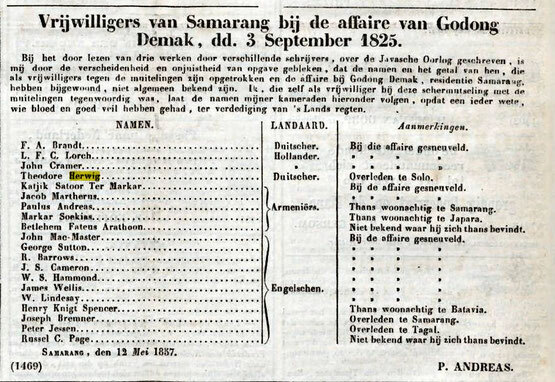 2) Mind: In this list only 2 Dutch volunteered.!!! 3) Number 4 on the list: Theodore Herwig was an uncle of Anna Johannes. He was the brother of her mother and died 1834 at Solo. Go to page Agha Hovsep Part 4.